Sobralias produce some of the most ephemeral flowers in the entire orchid family. The poignant combination of beauty and brevity in nature is a source of wonder to some and disappointment to others. 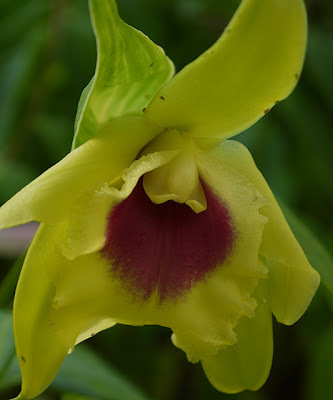 Alex D. Hawkes, in his Encyclopedia of Cultivated Orchids, notes sadly, "The blossoms of Sobralia are usually large and handsome, and occur in a wide range of colors, but unhappily they seldom persist in perfection for more than a day or two. Despite this failing, they are produced over a long period of time... and their extravagant beauty never fails to attract attention." And he goes on to say that great opportunities await some enterprising breeder. Why should the ephemeral nature of Sobralia flowers be thought of as a flaw? Can the value of a living thing really be measured by the hours, weeks or years that it survives? On the day when a Sobralia flowers, it never offers up just one or two shy blossoms. The entire plant, every reedy stem, bursts into flower simultaneously as the sun rises. 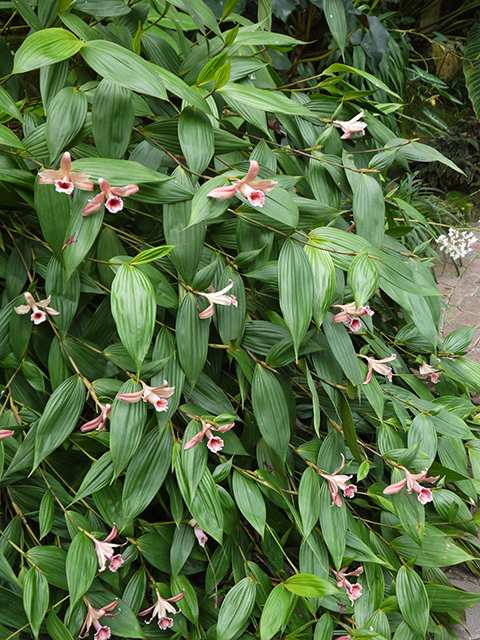 And it's not uncommon for all of the plants of a given species, like the S. atropubescens pictured above, to flower on the same day in the Orchid Display House. To me it feels like a privilege to see so much concentrated beauty.